As many have no doubt discovered, Battle for Zendikar Fat Packs are sold out at the manufacturer level, and it is unlikely that there will be a reprint. With the secondary market demanding $60-$80, Battle for Zendikar Fat Packs are less and less appealing. 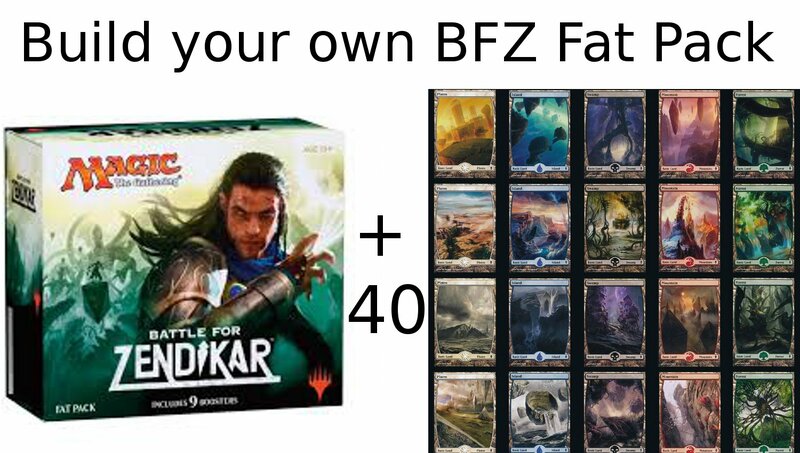 However, we realize that the Full Art lands are highly desirable, so we’ve decided to offer a “Build your Own BFZ Fat Pack” deal. Buy 9 packs of Battle for Zendikar for $39.99, get a free spin down life counter and 40 original Zendikar Full Art lands of your choice. Offer is valid until October 15, in-store only, while supplies last.